Since most complex trials deal with issues and subjects that are well outside the ordinary person’s experience, a trial lawyer’s job, and by extension that of a litigation consultant, is to help the jurors understand these topics. One of the best ways of doing this is by using analogy and metaphor courtroom exhibits – in other words, by showing how the complicated scientific or legal concepts in the trial are similar to things that a juror sees every day. A metaphor is defined as a figure of speech that uses one thing to mean another and makes a comparison between the two. An analogy is defined as a logical argument that shows how two things are alike by pointing out shared characteristics, with the goal of showing that if two things are similar in some ways, they are similar in other ways as well. In the presentation of evidence with courtroom exhibits, metaphor and analogy are used together to achieve a result – that the jurors understand a concept that might have been foreign to them. For example, a lawyer might tell the jury, “The stock market is a supermarket.” Well, the stock market isn’t literally a supermarket, so that is a metaphor; it uses the term “supermarket” to refer to the stock market. Then a courtroom exhibit could point out the points of similarity between a supermarket and the stock market, with the result that the jury would think of the stock market as a market and would treat events in the trial that occurred in the market as if they occurred in the market. To show that a patent must be precisely and narrowly defined, we used the courtroom exhibit (below) that compares a patent with a piece of land whose boundaries are precisely stated. Just as a jury would think there’s something amiss with a property whose boundaries are unclear, they would think the same of an ill-defined patent. We made an analogy in the courtroom exhibit (below) between a data CD and a legal pad. Information can be written on the CD, erased from it, or recovered from it just as if it were written in pencil on a legal pad. In effect, the CD is, metaphorically, a legal pad. In showing that a nuclear power company incurs storage costs, including direct and indirect costs, we made an analogy with an automobile repair shop (below), which may need to store unused oil if it is not picked up. 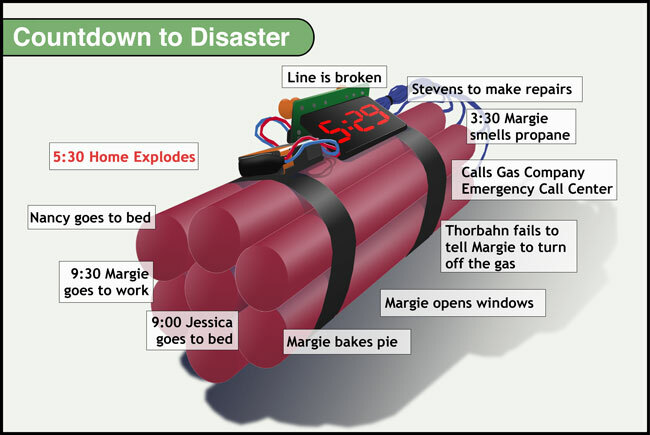 In depicting a sequence of events leading to a home explosion from a gas leak, we made an analogy to a ticking time bomb. In this courtroom exhibit, the metaphor is a visual one, as the sequence of events (below) is “wrapped around” dynamite sticks. 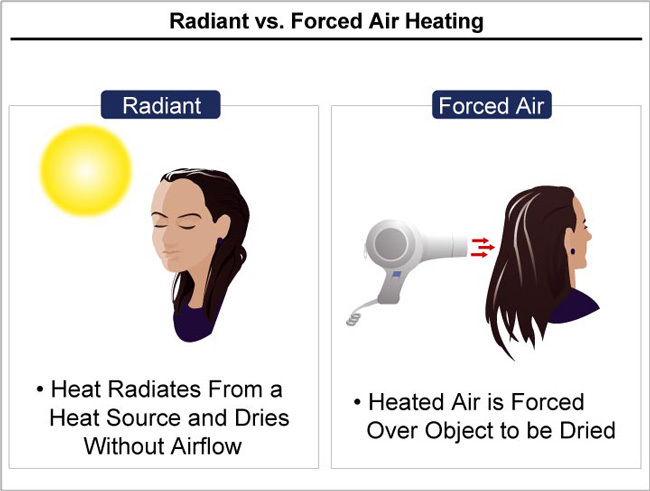 Finally, when we needed to show the distinction between drying an object by forced air versus radiant heat, we made the visual analogy to someone drying her hair (below). Either process would dry hair, but they are different processes. Experienced litigators frequently tell us that they avoid using analogies, because the analogy might be "flipped" and used against them by opposing counsel. In our experience, 1) this almost never happens; 2) when opposing counsel attempts it, the judge or jury can usually see through the attempt and it carries little weight; and 3) by using courtroom exhibits to depict the analogy or metaphor, opposing counsel's ability to change its meaning is much more limited. Finally, as far as discovering the best and most effective analogy/metaphor for your courtroom exhibits, we recommend one of two approaches. Either, 1) conduct a mock trial and listen to what the mock jurors come up with; or 2) work with your litigation consultants to choose several analogies and test them with a lay audience in a mock trial setting or test them through conversations with people unfamiliar with the case.